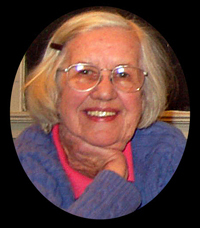 Bluemont friends and neighbors mourn the loss of Anne Plaster on February 20, 2009. Anne was an indefatigable, spirited New Englander (University of Maine 1954) who married into an old Bluemont family—that of Henry Plaster. She began her life in the National Capital area working in the Eisenhower White House. Over the years, Anne was a leader in the Bluemont Citizens Association, the Bluemont Fair, and in the long-term effort to save the E.E. Lake Store. For many of us she will always represent the very spirit of Bluemont village. We shall miss Anne, her wit, grit, patience, and humor. The funeral will be held Saturday, February 28, at 11:00 at the Good Shepherd Episcopal church in Pine Grove. Reach the church from Bluemont by going west on Route 7 and turning right on either Pine Grove Road or Good Shepherd Road (the church is at the intersection of these two roads). Burial following at Ebenezer Church. Celebration of Life Memorial at the Plaster's farm this spring (exact date TBD). No flowers please -- there will be an announcement of two charities in lieu of flowers.